Spark goes to the Museum of the African Diaspora in San Francisco to see an exhibition of paintings by an artist who has been called one of the most important African American landscape painters of the 20th century. But this label doesn’t accurately describe the breadth of Mayhew’s experience and perspective. 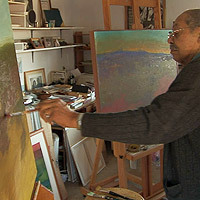 Spark then travels to Mayhew’s studio near Santa Cruz to discuss his life and work, and watch him paint. The MoAD exhibit runs through March 7, 2010. Travel to Santa Cruz to the studio of landscape painter Richard Mayhew to discuss his life and work.